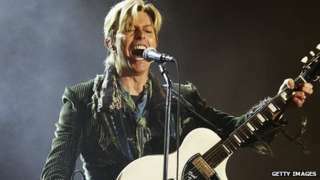 Rock legend David Bowie has been named best British male at the Brit Awards in London, although he was not there in person to collect his award. Arctic Monkeys won both best group and best album for the third time. Ellie Goulding won best British female, while pop act One Direction were honoured for their global success for the second year running. Kate Moss collected Bowie's prize and read a speech on his behalf urging Scottish voters to reject independence. "I'm completely delighted to have a Brit for being the best male - but I am, aren't I Kate? Yes. I think it's a great way to end the day. Thank you very, very much and Scotland stay with us," were his words - as delivered by Moss. Overnight figures show an average 4.2 million viewers watched the ceremony live on ITV - the lowest audience since at least 1999. Last year's show was watched by 6.5 million viewers. One direction also won best British video, in a public vote. Their win, for the track Best Song Ever, was helped by their 17.8 million-strong Twitter followers. With the honourable exception of David Bowie, what's notable about this year's Brit Awards is the sheer youthfulness of the winners. Almost everyone on the podium was in their 20s, with New Zealand goth-pop singer Lorde a mere 17 (she ties with Joss Stone as the youngest-ever Brit victor). And it's a positive thing. The Brits need to represent the vigorous pop and dance scene, because almost every other ceremony almost exclusively rewards middle-aged men. Ultimately, though, it was the cross-generational appeal of resurgent rock rebels Arctic Monkeys that stole the show. Their comeback began with a headline set at Glastonbury last year, and culminated in tonight's historic third "double win". But as frontman Alex Turner humbly noted backstage: "I don't think the talent of a group of musicians is directly proportional to the size of their trophy cabinet." The ceremony at the O2 Arena also featured a host of performances, including from Beyonce and Katy Perry, who put on a colourful, Egyptian-themed show. But Perry lost out to New Zealander Lorde in the race for best international female. Bruno Mars also gave a live performance, just shortly after picking up the prize for best international male. Bowie's prize came at the expense of four much younger hopefuls - Jake Bugg, Tom Odell, John Newman and Mercury Prize winner James Blake. At 67, he is the oldest recipient of a Brit Award in the ceremony's history and the award comes 18 years since his last Brits success. The singer, who released his The Next Day album after a 10-year hiatus, previously won best British male in 1984. But the star, who spends much of his time in New York, did not attend the gala. Noel Gallagher, announcing the award, remarked: "You maniacs didn't think he'd actually be here? David Bowie's too cool for that." The ceremony was wound up with a medley by Pharrell Williams and Nile Rodgers, who played Daft Punk's Get Lucky, Chic's Good Times and Williams' current feelgood chart hit Happy. Goulding lifted the first prize of the night and said she was "genuinely in shock" and "shaking". "This means so much to me, I can't even tell you," added the musician. Her award, presented by singer Prince, comes four years after she was named the Critics' Choice, a prize won this year by Sam Smith. Arctic Monkeys repeated their best group triumph of 2007 and 2008, and frontman Alex Turner joked that they had put money on rivals One Direction to win. Speaking backstage, Turner said of their triumph: "It feels wonderful. It's wonderful to receive that acknowledgement on a night that celebrates British music. "[But] as wonderful as it is to be nominated for something you create, I don't necessarily think the talent of a group of musicians is directly proportional to the size of their trophy cabinet." "For us, I think any victory comes closer to the conception of the album or the song in the first place," he added. While One Direction scooped two prizes, they were denied a third by dance group Rudimental, who won best British single for the number one hit Waiting All Night. From a clutch of three nominations, Bastille were named best British breakthrough act, while French dance act Daft Punk took best international group. For the third and final time, comedian and actor James Corden presided over the ceremony. The DNA of a Brussels bombing suspect, named as Najim Laachraoui, has been found at scenes of the November attacks in Paris, Belgian prosecutors say. How do Leicester's titans compare? Meet the women taking the "A4 waist" challenge. How risky is the new Innovative Finance Isa? Why can’t the date of Easter be fixed?